Not any organization, confederation, church, party and the civil society at any time would have cared about this restriction of movement; further more, it was a consent, that this law was enacted in a legal manner by democratic decision of the majority of the elected representatives of the people and because of this it has to be observed as a legal law. Hardly not anyone had understood the spirit of the German constitution – that one agrees in unalienable basic rights, which had to be guaranteed to each human without any reservation. Nobody in any German office (except of Inge Hannemann from the job center Hamburg/Altona) got the idea to put in question any official decision not to be on the ground of the constitution; in their eyes exclusively a court had to ask this. Any enacted law has to be assumed in principle (until the opposite proof by the Federal Constitutional Court), to be in accordance with the constitution, even if the opposite is staring into the face . All parliamentarians had taken an oath on the constitution and every act of them has to be regarded to be in accordance with the constitution by hundred percent because of this. And because, basing on this axiom, all enacted law must be in accordance with the constitution by hundred percent, nobody has the right, to put into question the enforcement of such a law. This is the typical way of thinking of a pro-democratic German, may be, he is engaged in church, in a party like the Greens, in a trade union or any other organization. I see it as a complete disgrace to award honors to governmental and non-governmental organizations about an issue, which they had promoted halfhearted by a low level of engagement, without to mention the real asserters by at least one word! It was the refugees, seeking asylum in Germany, which had initiated the abolishing of this racist law and which were struggling for this by enormous efforts! They organized themselves under the most severe conditions and had taken full risk to remove this eyesore of a free state under the rule of law. They fought for abolishing of this law by means of peaceful protest and civil disobedience since it was enacted, but especially in the last decade. They wrote uncountable letters to officials, I appended one of them from the year 2003. The struggle against Residenzpflicht was published on internet sites, news papers, by speeches and in other way to the international public, like by the book, published in the USA, from which I had taken the appended letter. Uncountable demonstrations and rally's were organized and executed for the demand for abolishing Residenzpflicht and to inform the citizens. Uncountable refugees took the risk of civil disobedience to set a signal against this unjust law and therefore accepted drastic personal disadvantages . If someone is deserving distinction in first place for his fight against Residenzpflicht in Thuringia, then this is Felix Otto. For him this struggle against Residenzpflicht (and no other reason) meant 8 months in prison and deportation after this to a country, where he was threatened by torture and death. It was these signals causing public attention, made by activists like Felix Otto in this way, which, in turn, motivated others to join the struggle for this aim. It would be reasonable to name a public place or a street after him. But a few days ago, I got a letter in turn on my protest letter to prime minister of Thuringia, Mrs. Lieberknecht from the Thuringian State Chancellery . In this letter was justified imprisonment and deportation against Miloud Cherif, another leading activist against Residenzpflicht, as suitable instead of appreciate him for his contribution for removing a relict of Fascism out of the German law. 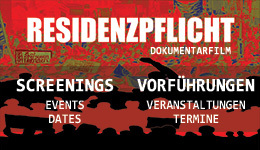 Furthermore, the struggle is not over, Residenzpflicht is not abolished concerning the German state. Sure enough, everybody who was engaged in abolishing Residenzpflicht deserves appreciation. But it is unworthy to omit those on citation, who initiated it and raised public pressure, even on international level, by unbelievable efforts. I am writing in response to your letter dated 10 September 2003, charging me for violating “landkreise”, in Hagen, Hauptbahnhof on the 20h July 2003 as reported by the Bundesgrenzschutzeinspektion Dortmund. By this letter you expect me to pay a sum of 68 Euros 10 cents for such an accusation. The following reasons explains why I do not respect the residence obligation, how I see the law of Landkreise and also the fact that under no circumstances will I ever be forced to pay for my freedom of movement which is a fundamental human right. 1. This law is discriminatory and a primitive law which has no place in a civilised society which is cultured. It is a form of collective punishment which violates not only the fundamental and basic human rights of human beings of the freedom of movement but also contravenes numerous international conventions and articles which Germany is a signatory; for example: Article 13 of the Universal Declaration of human rights (UDHR), the Geneva Convention and the European Convention on Peoples and Human Rights. 2. As a Human Right Activist, I see this “Pass Law” in the same like as the apartheid Pass law which dehumanised black people in the former apartheid South Africa because of their colour and background. It also empowers the police to brutalise such people and practice racial profiling. The law criminalizes people for no particular reason other than racism and xenophobia, which gives rise to police brutality. 3. This law goes against Article 1 of the German constitution which holds the human dignity as inviolable, except the system wants to tell us that, only Germans are considered human beings in this society and if so put it in writing to me, if not then Article 1 of this constitution should be applicable to everybody, irrespective of colour, background, race or legal status. 4. Having demanded protection from political persecution in this country does not make me a criminal nor subhuman who should be a detainee, incarcerated in a detention camp behind barbed wire enclosures in George-Marshall street 198 and as if this is not enough, expected to be placed within a landkreise or preventive custody. As a matter of fact I didn't ask for humiliation and imprisonment and characterised by mental and physical torture. 5. Residence Obligation empowers and maintains institutions and polices of terror which leads not only to oppression and brutality but also encourages arrogance and cruelty which are all wrapped up in a parcel of uncultured behaviour. I as a human rights activist and political figure have undergone inhuman oppression and brutality in my occupied territory of the Southern Cameroons in the hands of the occupational forces of La Republique du Cameroun where I am obliged to obtain, possess and carry laissez passer from administrative officers to enable me move from one district to another. I have been brutalised, detained and imprisoned because I stood up against such cruel, inhumane and degrading treatment and chronic dictatorship sustained by the West and finally forced into exile. To this end, I find no fundamental reason to be subjected to the same treatment in a country which prides itself with democratic values and respect for human rights by respecting human dignity. The residence obligation law does not only dehumanise and criminalizes me but goes at great length in preventing me develop strategies to mobilise my fellow Southern Cameroonians in Germany and the Diaspora to see how we can fight against the dictatorship and occupation in my country, so as to be able to return someday in a democratic and free Southern Cameroons where my dignity will be respected. As coordinator of the Southern Cameroons Youth Leage (SCYL) and spokesperson for this liberation organisation in Europe, duly registered refugee in Germany and neither a criminal nor indulges in criminal activities, I do not need to be placed in a protective custody called a Landkreise. Rather I urge the authorities to hasten up with my application for due protection as to provide me with resources to carry on with my political campaign against the repressive regime that has kept my people for over forty-three years in captivity. Having said all these and which more clarifications will be deposited if it persist, I do not need the permission or approval from any body or institution in order to engage in activities that will guarantee the independence of the Southern Cameroons where I expect to be free from persecution and where the respect of my dignity will not be a subject of race, origin or status. I fight injustice and oppression anywhere, anytime, no matter from whom it is coming and the form or shape in which it comes. “The true values of any society are its adherence to Freedom. Freedom belongs to everybody, no matter the colour, race, religion or background and any country that claims to be civilised, democratic and respect human rights must have it as a primary objective and responsibility to guarantee freedom to all without discrimination or distinction” and the freedom of movement is just one of such rights. I rest my case for the moment.